Today’s post was written by Kirk Koenigsbauer, corporate vice president on the Office team. We have several exciting new updates this month and hope you enjoy them! Giving customers better ways to work together is core to the new Office. Last month, we delivered Skype in-app integration with Office 2016 on the desktop and we promised that was just a first step. Now we’re taking Skype integration to the next level, first in Office Online and, over time, in the desktop apps, as well. Today we are announcing Skype voice and video integration in Office Online (Word, Excel, PowerPoint and OneNote Online) and in Outlook.com, so that you can now see and speak to your Skype contacts. The integration creates a natural, collaborative experience in which you can co-author and have a conversation using instant messaging or video calling right from within a document. Best of all, your instant messaging history stays connected to the document, so that the next time you open it, you can pick right up where you left off. 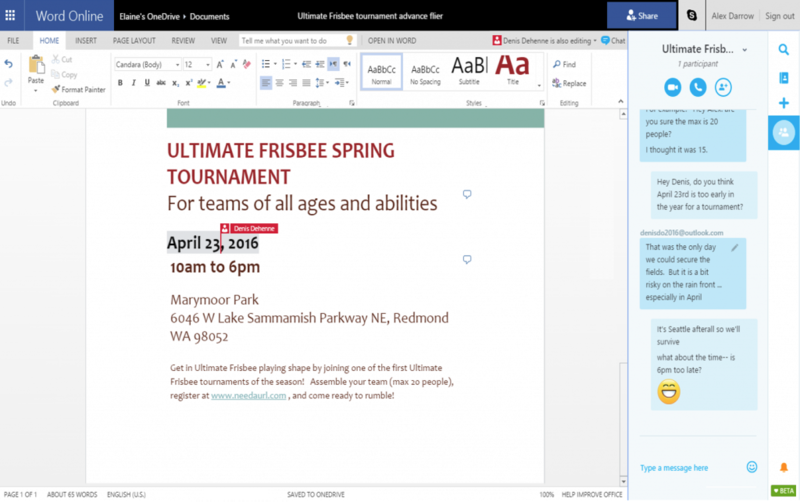 Office Online exists to help you collaborate with anyone, anywhere, with just a browser. Now with Skype communication built right in, you can get more done, faster. Skype integration with Office Online will be available to customers worldwide with a Microsoft account in November. We want to bring Office to you wherever you are. 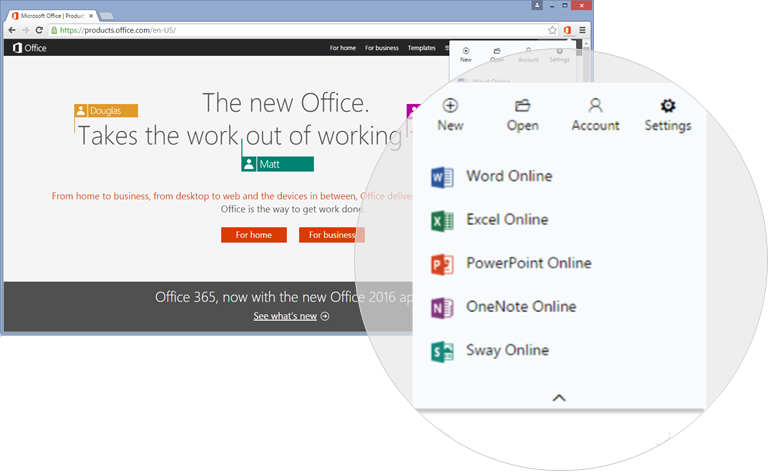 If you use Chrome, there is a new extension that lets you create and open Word, Excel, PowerPoint, OneNote and Sway documents using Office Online right from the Chrome browser. You can also use the extension to open and view existing Office documents stored on OneDrive, on OneDrive for Business and on your computer right from Chrome. Click here using the Chrome browser to get the new Office Online extension. One of the coolest things about being able to update Office regularly is that we can now address customer feedback more rapidly. Based on your suggestions, this month we added an enhanced Navigation pane to help you work with large documents within Word Online. We also added a number of formatting improvements with Excel Online and made performance improvements to PowerPoint Online. A lot of developers asked for improvements to the overall Visual Basic Editor (VBE) on Office 2016 for Mac, and we’re pleased to deliver several top customer requests. You now have the ability to Add Modules from within the Project Viewer, Add Library References using a Dialog and use shortcut keys for debugging. We also recently added two new commands to the Visual Basic object model for Mac: GrantAccessToMultipleFiles and AppleScriptTask and a new conditional, MAC_OFFICE_VERSION. For more information, see the VBE improvements section of the VBA improvements in Office 2016 blog post. We have an exciting set of new features and functionality coming in the next few months and we look forward to sharing them with you as they become available. In the meantime, thank you for using Office and please continue to share your feedback and feature requests with us at Office UserVoice. Are you ready to purchase? Buy Office 365 to get the new 2016 apps at Office365.com. Do you want to learn more? Visit Office.com/2016. Get the Office apps on Android, iOS or Windows devices. To get started with Office Online, visit Office.com.